Welcome to the endless dwarven realm! 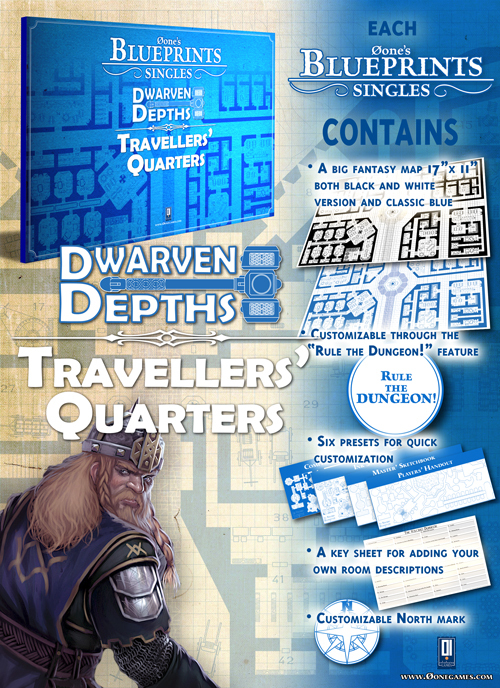 This Blueprints Singles series provides you a ever-expanding dwarven realm. Each map joins with the previously published map to form a giant underground settlement. Furthermore, each map is higly thematic, so you can easily insert it in your own realm or use it as a dungeon on its own. Going down the High Stone Road you find the well-known to foreigners Travellers' Quarters. This is where the traveller can find first-needed places, such as inns, taverns and some shops.